Iraqi Christians returning to their homelands trashed by Daesh (ISIS) have described the horror of finding their houses burnt and their churches desecrated. 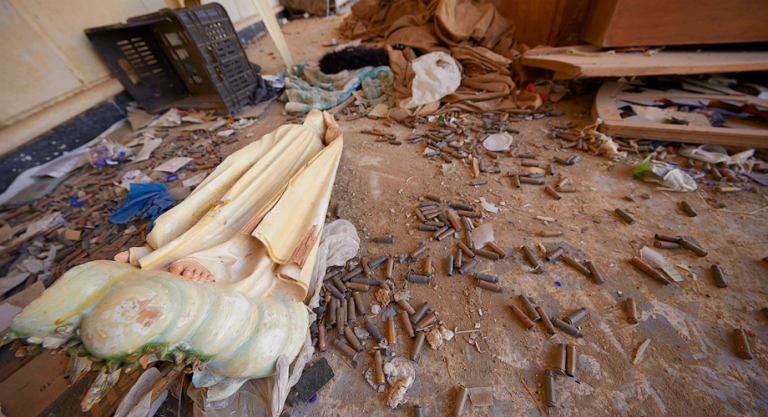 Speaking to Catholic charity Aid to the Church in Need, eye witnesses reported “the destruction caused by the jihadists” and how church statues were beheaded and mannequins from a clothes shop were used for shooting practice. Manal Matti used to run a beauty salon near the now fire-damaged Church of the Immaculate Conception in Qaraqosh, the largest Christian town in the Nineveh Plains. ACN reports show that Qaraqosh’s St George’s Syriac Catholic Church was used by Daesh as an improvised bomb factory and contained hundreds of bombs and grenades. The extremists also wrote battle plans on church walls and chemicals were found in the building together with instructions on how to mix them into explosives. Louis Petrus, another Christian, returned to Qaraqosh having fled when Daesh invaded on 6th August 2014. He said: “My house is damaged, most of my furniture has been stolen and my household effects are broken. Petrus described how he would go back to live permanently in Qaraqosh as long as a small number of families also returned to their community. He said: “This is my country. As soon as it is safe in the city and we receive permission to live here again, I want to rebuild my life in Qaraqosh. These and other Christians interviewed by ACN said they wanted to return to their homes but added that security and reconstruction was vital. Father Sharbil Eeso, a 72-year-old Catholic priest, was forced to leave Qaraqosh on 17th August 2014. Fr Eeso described thee security requirements that are now needed. He said: “Last week, a jihadist emerged from the tunnel system which IS has built underneath the city. ACN has provided emergency relief and pastoral support for Iraq since 2014, especially since Daesh forced 120,000 Christians from their homes following its invasion of Mosul and the Nineveh Plains.